The festive season can be stressful and after a long year you deserve to pamper yourself just as much as your family and friends… We have several specials at the moment to relax, rejuvenate and revitalize just about anyone! Why not pamper yourself with an 75 min luxurious facial with a complimentary 30 min Back neck and shoulder massage? Visiting long-lost family during the festive season is nerve-wracking enough, without having to worry about those dreaded lines and spots. Regain your youthful radiance with a Laser Genesis or microneedling session , which has been proven to reduce sun spots, Redness, smoothen facial lines and skin texture. 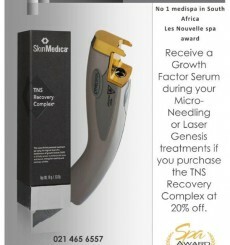 We will throw in a growth factor serum for FREE – and even better… we will give you a 20% discount on the well renowned Skin Medica TNS recovery complex to help you look 10 years younger!